Researchers and facilitators know the importance of capturing great audio from group discussions and focus groups because often robust analysis stems from original high quality sound recordings. Without great audio, evidence and precise findings are often difficult to extrapolate. When recording audio consider both the physical recording environment, and the functionality of your digital recorder. 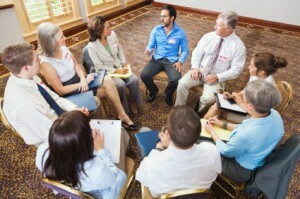 When choosing the venue for your focus group consider possible background noise intrusions, such as traffic flowing past, chatter from passers-by, loud air conditioners or participants scraping chairs or moving around, and the size of the venue. What are some things you can do to minimise these intrusions? Close the doors, turn off the air conditioner, ask participants to speak one at a time, and have food and drink either before or after the discussion, to cut down on participant movement within the recording space. If you are recording a small group in a very large venue, move off to one side or section off an area, so that the “cavernous” quality of the room is minimised and echo is reduced. If your group is sitting around a table and the recorder and/or external microphones are on the table, put a cloth under each to muffle interference caused by accidental table movement or audio reverberation. Make sure that participants are sitting close enough to the recording equipment so their voices aren’t lost, particularly those more softly spoken participants. If you are concerned that some of your participants may find external microphones confronting, consider boundary microphones instead of channel microphones. Boundary microphones are little “UFO” shaped objects which sit flush to the table, and are far less intrusive than channel microphones, which are mounted on tripods. You should also consider the use of external microphones to boost your audio if you are capturing over 8-10 voices, or if you are recording in a more noisy environment. 1. Sound quality – does the recorder have noise cancellation and voice filter functions for crystal clear playback in a potentially noisy environment? 2. Recording format – does the recorder record in an easily accessible and compatible audio format, like .wma, .mp3, .aif, .m4a or .ds2? Check with your transcription company as to which audio formats are preferred – Pacific Transcription lists all these as preferred audio formats. 3. Battery life v’s mains power – does the recorder give you flexibility in power sources and does the battery give you the highest amount of recording time that you need? Do you have a backup battery and a power adapter? 4. Internal and external microphones – Does your recorder have internal microphones which are purpose sensitive; that is, you can change the microphone function according to varying recording conditions? Can your recorder take external microphones, to boost audio quality of larger group recordings? So, what’s out there in the market now? Both Olympus and Philips manufacture extremely high quality digital voice recorders and external microphones which are specifically designed to record multiple voices. Olympus has traditionally dominated this area of audio recording, with arguably the best digital audio recorder on the market for recording focus groups, the DM-901 (superceded by the DM-7). On its own the DM-7 can easily record 8-10 voices successfully, and when boosted with external ME-33 boundary layer microphones, (up to 6) can successfully record 30+ speakers sitting around a large table. DPM8000 – a bit of a left-of-field addition for focus groups, but certainly worthy of mention. 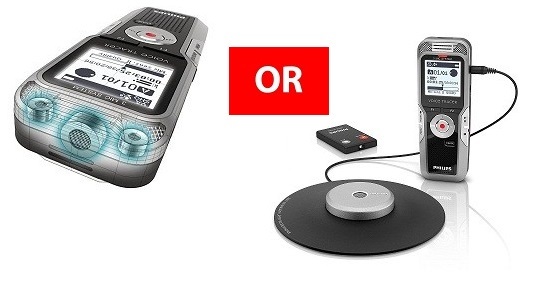 The Philips Digital Voice Tracer range includes the DVT5000 and DVT7000 (now superceded by the DVT8010). Designed to record multiple voices, and with an external boundary layer microphone and handy remote control (only included with the DVT8010 package), these two recorders are great for recording small groups. Boost the recorders with extra external microphones, and you have a wonderful focus group package which does everything you need it to. The Philips DPM8000, while technically a Dictaphone (that is, designed to record one voice at an extremely high quality level over lengthy periods for transcription purposes), has a “3D internal microphone” which permits high quality recordings of multiple voices. The results after testing in a room with a number of voices are stunning. I could not expect higher quality audio recording from any other recorder. However, as exceptional as it is (and I really like this product), it is principally a Dictaphone with added features, and, priced as a Dictaphone, out of many people’s price range. Remember, audio quality from your recordings dramatically impacts on the quality of your transcription. High quality audio makes for excellent transcripts and more accurate research results for you!